This paper takes up recent claims that de-secularisation is essential to the effort to decolonise critical thought (Anzaldúa 2015, Chakrabarty 2000, Stengers 2012). Whatever its multiple and divergent effects might have been, secularism can be seen as a crucial fold within the classificatory practices of European Universalism and the genocidal/terracidal abyssal thinking that it inscribes (Asad 2003, Santos 2015, Wynter 1995). The critique is particularly acute within feminism (Deo et al 2018, Mahmood 2007) – insofar as feminist-secularism has been rendered the (sometimes kicking-and-screaming, sometimes willing) partner of Islamaphobic violence – and within post-development and indigenous politics – wherein the anti-capitalist defence of land, modes of life, ecologies and the pluriverse are increasingly articulated around the sacred (Escobar 2011, Danowski & Viveiros de Castro 2016, Johnson & Kraft 2017). It finds resonance in recent political-philosophy turns to theology or spirituality (Bennet 2001, Cornell & Seely 2015). Reflecting on my own pedagogic practice, I enquire what it might mean to de-secularise critical social theory in the academy. Radically changing the subjects (the authors, the topics) is obviously paramount. However, I argue that there is also call to transform the existing canon by owning and affirming always already non-secular dimensions of ‘secular’ European social theory. One version of this might be to re-envision feminist materialism (its contributions to political economy, its biopolitical theory, its embodied empiricism) in the more-than-secular terms of a political ontology of love. 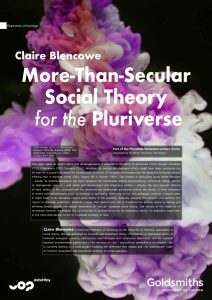 Claire Blencowe is Associate Professor of Sociology at the University of Warwick, specialising in social theory. She has published on Foucault and biopolitical theory, the problem of biopolitical racism in feminism, emergent authority, participatory methodologies and ‘alternative objectivity’, and the relations between environmental catastrophe (‘the intrusion of Gaia’) and political spirituality in the present. She is currently working on a book project exploring the difference that religion and ‘the post-secular’ make to feminist materialism and biopolitical analytics of racial-capitalism.